Who invented sign language ? When ? How ? Why ? What !? Who invented sign language? When? How? Why? What!? Who invented sign language ? I must tell you from the start that I am not going to drop you any name ! Because there are none in fact. It’s true that Juan Pablo de Bonet, a Spanish priest, published in 1620 the first known signed alphabet. It’s true also that in the second half of the 18th century, Charles-Michel de l’Epée (what a fine name by the way ! It very elegantly translates into Charles-Michel of the Sword) dedicated his life and fortune to the creation and the development of his school for the deaf. He devised a method linking the sign language that he saw his students use to the French written language. But those two men were not the ones who invented sign language. 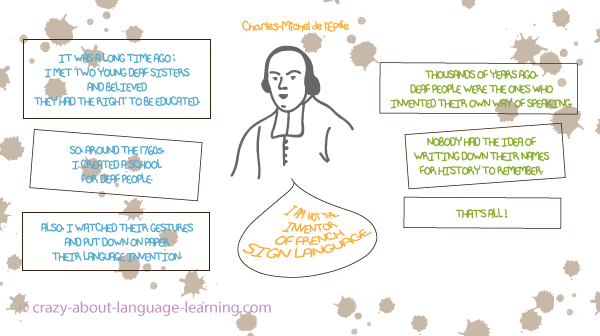 As the drawing above points out, Charles-Michel de l’Epée (as other sign language pioneers in other times and in other places) have done their best to put on paper, to synthesize in the form of language learning methods all those exchanged signs they were witnessing. 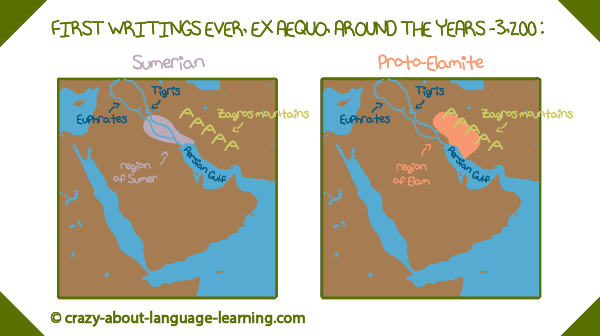 But all they really did was to transcribe the sign languages on paper; they didn't invent them. If we were deprived of our tongues and voices, and if we wanted to point things out at each others, wouldn't we try to make ourselves understood, like the deaf, with signs of our hands, heads and of our entire bodies ? In those ancient times, deaf and mute people were not nearly getting the consideration they deserved. They were often considered as laess intelligent than speaking people. This lack of recognition of their intelectual capacities has been an important obstacle to the development of their language, of their education and thus of their self-fulfillment in society. 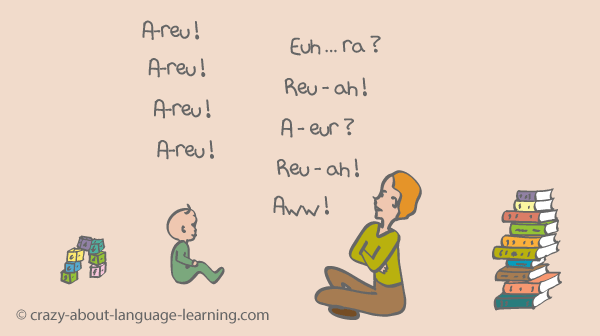 In the face of those difficulties, they however succeeded in creating fully developed languages. So then, who invented sign language ? A few deaf people, maybe only two of them, whom we will never know the name of ! Nobody remembers the names of the persons who created the first sign language, but by deduction, we can affirm with quasi certainty that they were deaf people. Those who are commonly cited as having invented sign language are therefore “only” the persons who contributed to the education of deaf people and to the diffusion of their languages. Nowadays, a lot of persons all over the world are learning sign languages even though they are not deaf nor have signing people in their family or entourage. Why not you&nbsp?